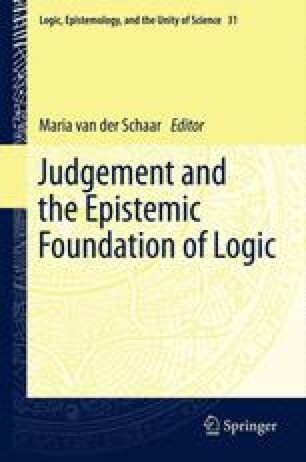 The term verificationism is used in two different ways: the first is in relation to the verification principle of meaning, which we usually and rightly associate with the logical empiricists, although, as we now know, it derives in reality from Wittgenstein, and the second is in relation to the theory of meaning for intuitionistic logic that has been developed, beginning of course with Brouwer, Heyting and Kolmogorov in the 1920s and early 1930s but in much more detail lately, particularly in connection with intuitionistic type theory. It is therefore very natural to ask how these two forms of verificationism are related to one another: was the verificationism that we had in the 1930s a kind of forerunner of what we have now, or was it something entirely different? I would like to discuss this question by considering a very particular problem, which was at the heart of Schlick’s interests, namely, the problem whether there might exist undecidable propositions or, if you prefer, unsolvable problems or unanswerable questions: it is merely a matter of wording which of these terms you choose. As I said, it is a problem which was at the heart of Schlick’s interests: it is explicitly discussed already in his early, programmatic paper Die Wende in der Philosophie in the first volume of Erkenntnis from 1930, and there is a short later paper, which has precisely Unanswerable Questions? as its title, from 1935, and he discussed it on several occasions in between also.